DUMBARTON and Raith Rovers fought out an entertaining 2-2 draw at the Dumbarton Football Stadium in their final SPFL Championship match of the season. Nothing was at stake except pride, but the 801 crowd enjoyed a battle which ebbed and flowed. Dumbarton opened the scoring when top scorer Garry Fleming burst through, his shot rebounded off the post, and Jordan Kirkpatrick was first to react and tap home. Both sides had further chances before the interval, with home keeper Danny Rogers having to be in fine form, but Sons went in after 45 minutes with a 1-0 lead. It took only eight minutes of the second period before Mark Stewart broke through and equalised for the visitors, and a few minutes later they went in front in bizarre fashion when a poor clearance by Rogers landed at the feet of Lewis Vaughan, who lobbed the keeper from the halfway line. 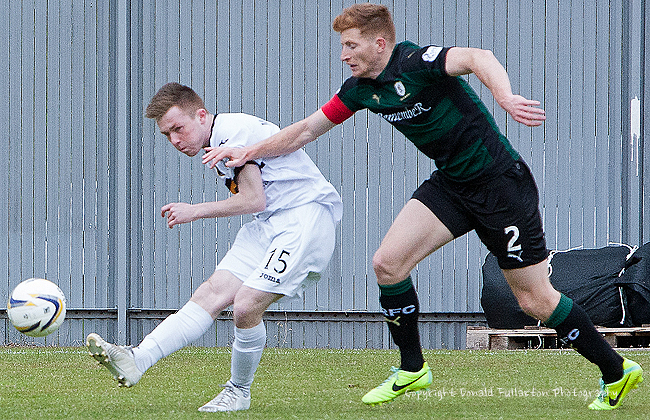 The home side restored equality in the 78th minute when young sub Donald McCallum sent over a cross (pictured) and an attempted clearance went straight to man of the match Scott Agnew who fired it home.